How to Decorate With Pink -Pink, the offspring of red and white, has become a major color option in home design. And it’s no longer limited to the nursery or little girls’ bedrooms; through the creative ideas and visions of a few talented designers and homeowners, the color pink has grown up and graduated into adult rooms and decorating styles. Go all out with an all-pink room, or just use a few pink accents to spark up a neutral color scheme — if you love the color pink, let it show. Pink Is Fun -Pink is a fun color, and it plays well with others. Try using a pink-plus-another palette. Soft shades of pink keep the room hopping and the accents of grayish-blue add a touch of calm. The touches of metallic decor on the walls bring in a bit of glamour as well. When decorating with a lot of pinks plus another color in the master bedroom, it’s a good idea to find a neutral base color—such as white—to keep the look mature. Pink’s Older Sister: Burgundy -When decorating a pink room, you aren’t limited only to the softer tints or bubblegum brights. Lightly shade pink with black, and you get its older sister: burgundy. And burgundy works beautifully to set off cool colors like gray, navy blue, deepest purple, and even black. Use a few burgundy accents to wake up your contemporary, subdued bedroom without any fear of saccharine sweetness. It’s the perfect way to add a touch of romance without being cloying or obvious. Take an additional decorating tip from this room, and use a favorite piece of artwork to tie together a room’s color scheme, or determine what colors to use. Pink-Tastic Eclectic Bedroom -Not everyone desires the level of enthusiastic drama displayed in the colorful pink bedroom featured here, but it sure is fun to look at. Designed by Woodson & Rummerfield’s House of Design, an eclectic and glamorous bedroom looks like it could belong to a princess or film star. The strong salmon pink walls easily hold their own against the equally bold furniture and window treatments, to say nothing of the magnificent mural at the head of the bed. But because all of the furnishings are neutral in color (actually transparent in the case of the posts on the bed), the overall effect is stunning but not overly stimulating. Takeaway tip: if you want to use very strong color on your walls, balance it out with neutrals in the furniture, floors, and accessories. Sophisticated Girl’s Bedroom -A girl’s pink bedroom needn’t be sweet and cutesy. This fresh-yet-sophisticated room shows off a French-inspired patterned headboard, fun wallpaper, and just-enough-color bedding that added all together, creates a great design that would not only thrill just about any young girl, it would equally delight most teens and even adults. Plus, this room can be transformed easily into a guest bedroom by changing out the accents, such as swapping the stuffed animals for new decorative pillows. Vibrant Pink Grows Up -Even vibrant, hot pink is a viable choice for the master bedroom, as long as you balance it with a base of white or another soft neutral, such as pale gray, sand, or cream. Go ahead and get bright with the bedding and smaller accents throughout the room, but keep the walls and floors neutral. This bedroom shows a creative use of color that works well with the textured wallpaper while still maintaining balance and harmony. 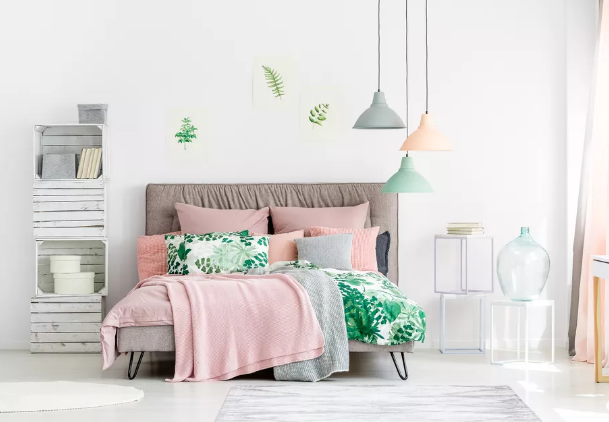 Fresh, Modern Take on Pink-While contemporary style is often a study in gray or other subdued colors, there are always exceptions to the rule, especially if the design and concept are well thought out. A good example is the contemporary bedroom designed by CWB Architects that uses a bright pink wall color with two neutral secondary colors–white and brown–along with a couple of lively accent colors–baby blue and sage green–to create a wonderfully relaxed and updated style that would work just as well in a teen or guest room as in the master bedroom.The animal print area rug adds an extra touch of fun.Continue to 8 of 9 below. Classic Pink and Green -Bright green pops when paired with shades of pink. This combination is often used in teenage or little girl bedrooms, but if combined with sophisticated patterns and decor, the color scheme also fits nicely in a master or guest bedroom. The key to successfully working this palette is the use of plenty of white to create the harmony needed in your design. Notice also how the drapes match the throw blanket and shams; limiting the patterns in the room is another way to keep bright color under control. Combine Shades of Pink- An easy way to decorate with color is to mix a lighter version of your favorite hue (here it’s pink, of course, but the same principle applies with any color) with a few pops of the same color’s brighter or darker version then balance it all out with plenty of white. The result is a gorgeous, monochromatic color scheme that is both easy and failproof. A monochromatic palette also works to visually enlarge a very small space.